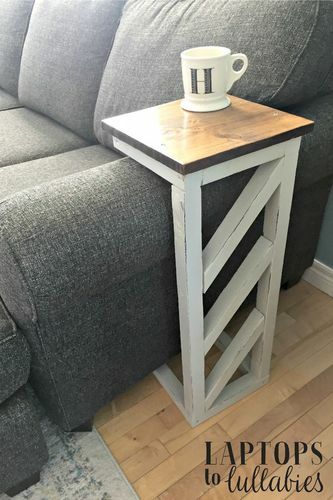 I am currently making couch end tables and am trying to find a secure way to join a 1×2 that is cut on a 45degree angle to a 2×2. I have tried using my kreg jig but I am having problems getting it to work as I need to put one of the hole on the short end of angle so that the pocket is on the bottom (so its not visible). I would like something more secure than just wood glue. Does anyone have any ideas about sturdy but simple ways to join them? I’m not a big pocket-screw guy, but I do use them for face frames. Do you have the little Kreg mini jig? 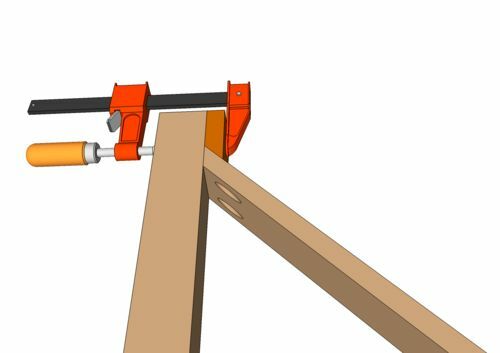 If so, clamp this to the work piece on the short side of the miter—- and use a long (1 3/4 – 2”) screw. Clamp it up to immobilize it before driving the screws. 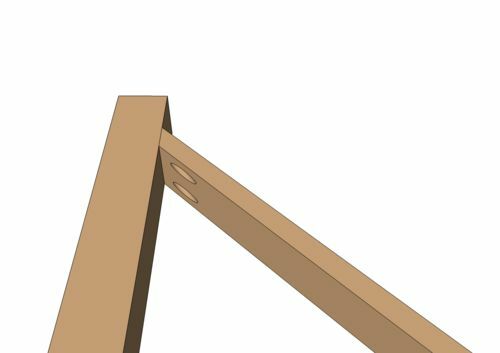 Alternatives to pocket screws would include dowels, biscuits, Dominoes, and loose tenon. That is exactly what I am trying to do. I don’t have the mini but I have the R3 (the two holed jig), I was playing around with some scraps and one of the problems I kept having is the screw wouldn’t bite into the 2×2. It would just ride up it a ways, would I prevent this by drilling a starter hole through the pocket hole I drill in the 1×2? I don’t think you’ll have any success doing that. I think even if you predrill, with a very long bit, when you tighten the screw it will slide your brace out of place. 1×2 to land in. Then pockets screws can hold it in the notch. There are a few ways to deal with this. One is to cut a shallow dado allowing the 1×2 to seat into it. No need to make an angled notch as your 1×2 is already at the proper angle. You obviously would have to account for that in the length of the 1×2 member. If you want to attach it to the face as is shown in the drawing, you have a few options. One is to clamp a pice of scrap across the 2×2 to prevent the 1×2 from riding down the 2×2 as it’s screwed into place. You could also first glue and clamp it and allow it to dry. Then screw it for reinforcement. However you could screw it from the opposite side and that would solve your problem. Glue is necessary for that joint to stay tight. 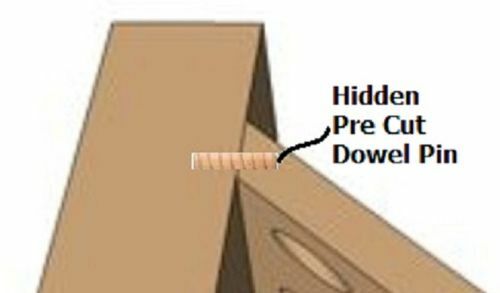 Do you have a way to cut dowel holes? They would be stronger and potentially easier to execute here. I don’t have a way to cut dowel holes. I am pretty new to all this and have limited equipment. It is looking like I am just gonna have to screw them from the outside. I was hoping to avoid that because I didn’t want to see the screw heads. The braces are just for decoration so wood glue should hold them in place I suppose. Sailor – does one of the boards have a show side? or are both show sides. can you make a sketch or drawing of what you are trying to do ?? copy of a photo from the interweb that resembles your plan ? do you have plans you are working from ? there are still options that will work – if the gallery can fully understand your issues. off flush. Looks ok. Easy. to hold the parts in place. This is what I am trying to make, however mine is going to be all stained instead of painted and I am using 1×2s instead of 2×2s for the braces; so I didn’t want to screw in the braces from the outside like she did here. I don t have a way to cut dowel holes. I am pretty new to all this and have limited equipment. It is looking like I am just gonna have to screw them from the outside. I was hoping to avoid that because I didn t want to see the screw heads. The braces are just for decoration so wood glue should hold them in place I suppose. There is your answer. If it’s not structural, you don’t need any reinforcement. Just glue it in place. Use a good wood glue (like Titebond). Take some time to figure out how you are going to clamp it in place. You want some reasonable pressure holding the joint together while the glue dries. One thing many of us would do is to cut a small block of wood out with the opposite angle and glue it to the top surface of the 1×2. Let that dry overnight. That block can then be clamped to the 2×2 because the face will be square to the 2×2 and hold the joint together. When the actual joint is dry, cut off the block and sand the glue line away. an option that I would probably use is the hardwood pre-cut dowel pins. project would be a good candidate for it. larger so when the epoxy is applied, you can hold the pieces in place while it sets up. keeping in mind that stains do not stick to epoxy. so you have to work neatly. to get it as neatly as possible. 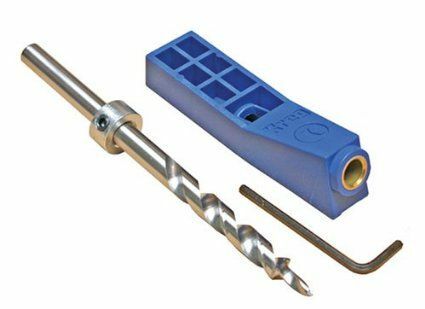 I would just countersink 3 screws from the outside, glue and screw the joint, and then plug the holes with pine or oak raised rounded button type plugs. Even them out and use 4 plugs. I think it would look good and be sturdy. I think if you clamp on an angled block, and drill a small pilot hole, you’ll be able to get these screwed in. But there are other options, as discussed above.